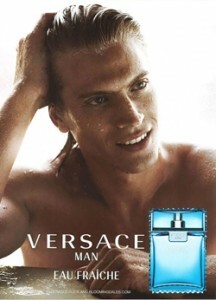 VERSACE EAU FRAICHE MEN. A new olfactory harmony where the most classic ingredients of men’s fragrances are renewed with unusual accents, giving rise to a surprisingly fresh fragrance. His notes express a sparkling character and maverick, are mixed with notes paneled surround. A fragrance to seduce, fresh and masculine. A new version of the Versace Man fragrance turquoise, playing with light. This new version of Versace Menes is fresher and more aquatic. While the original Versace Man had a certain air latino because snuff notes and oriental surroundings, Eau Fraiche has a Mediterranean quality with some woody notes. Top notes are lemon, bergamot, rosewood, and rose. Heart notes are cedar, tarragon, sage and pepper. The base notes are amber, musk, saffron and woody notes. Versace Eau Fraiche was created in 2006, with the nose behind this fragrance the famous Olivier Cresp.